Time to be totally free, and estranged. Time to give up our souls, to set fire to structures and run out in the street. Time to ferment. How else can we leave the world vat and go to the lip? We must die to become true human beings. MY FIRST DECADE: I grew up in a Lutheran household, attending church regularly. My grandmother and I bonded over a heart-full love of the Christian God. I was passionate about Jesus, and found great comfort and joy in knowing of his love for me. TEENS: I came of age in a large extended Norwegian family. My uncles and great uncles, my father, grandfather and great grandfather were all medical doctors. They were all invested in the family business, a medical clinic begun by my great grandfather in the 1920’s, when medicine based in scientific thought competed with folk medicine and “quackery” for dominance. Many of the women were powerhouses too. My great grandmother raised 7 sons and a daughter, held Ibsen Club in Norwegian in her dining room, and kept the generations of her family steeped in Norwegian culture, language and holiday traditions. My mother was a member of the elected school board while I was in high school. An aunt was an elected member of the county board. My grandmother led a campaign to raise $5 million for the national League of Women Voters for its 50th anniversary in 1970, and sat on the Board of Wellesley College for many years. There were between 2 and 7 of my cousins in every grade level of my schools growing up. It was a rich, nourishing, inspiring holding environment for a young girl. I was imprinted with notions of striving, social responsibility, conspicuous success. I also yearned for anonymity. Another important influence from my Scandinavian roots is love of the natural world. Churches are small and poorly attended in Norway, as most Norwegians would rather be hiking or skiing. Together with my family, I skied, skated, sailed, canoed, biked, hiked and swam. My grandparents bought a small farm 20 miles outside of town where we all gathered to enjoy the seasons, play in the woods, sled down the hills, fish for trout in the pond, work in the gardens. I learned the names of the trees, the birds, the wildflowers. After years of sitting through dull Sunday morning worship services, I rebelled against the institutional church, sparked largely by deep questioning of the tenants of the faith which I studied in confirmation class. I came to the conclusion that I did not believe in God, nor did I believe in the hell to which the church warned I would be eternally condemned for this rejection of their Maker. My earlier spiritual passion found purchase in a new arena, befitting of the late ‘60’s and early ‘70’s, that of fervent political belief. It seemed to me that heaven, and hell, were here on earth, in the form of the suffering I saw all around me. I became an activist against the war in Vietnam, for environmental causes. I volunteered for George McGovern’s presidential campaign, organized a Walk for Mankind. TWENTIES: In college I majored in political philosophy. I saw life through a Marxist, feminist lens. Religion was the opiate of the masses. A critical analysis of capitalism, and organizing on behalf of those oppressed by its paradigm would eventually lead to revolution from the bottom-up. I rejected the class system, and my own and my family’s upper-middle-class values and lifestyle. I lived on the far edges of the culture I had until then been a part of, choosing jobs and living situations that reflected my counter-cultural, revolutionary outlook. In quieter moments, I nurtured a very private fascination with monasticism. There was something so compelling to me about people who chose to live outside of the cultural mainstream, much as I was, but from a very different motivation of finding God in the quiet and stillness. I read the novels and saw the movies about monastic life, and in college, visited a monastery with a friend who was doing research for a class. But, mostly I was devoted to a life of struggle against the suffering I saw everywhere I looked. I met, fell in love with, and married my husband, who shared my lifestyle and my conviction that people would eventually rise up against the system I believed was the cause of all injustice. THIRTIES: Having children, and the Reagan years, began to shift my energy away from my single-minded focus on building a revolution. Giving birth to and nurturing two infants opened my eyes and my heart to the potent and very physical, instinctual world of mothering. As my children grew, I felt a conflict between my devotion to the movement and my devotion to them. But, in the end, I could not sustain my political fervor. I was worn out by what I saw as the frustrating tendencies of humans to mess up any and every compelling social movement. All the institutions I worked for were plagued with political divisions, financial woes, waning memberships. The light of my awareness was turning around to shine within. I completed two courses of individual psychotherapy as I grappled with being a wife, mother, daughter and friend without political work to define me. Therapy helped me to feel my emotions, to relax more, to confront the pain of my parent’s divorce. We bought a home, got a puppy. I left my last movement job and went to massage school, and though it felt like I was cutting off my right arm, I was deeply relieved to find work that demanded I slow down, breathe, and take care of myself, a few clients and my family, rather than the whole world. Being drawn to an alternative healing modality also fueled my continuing rebellion against my family as the embodiment of the medical model. I alternated between feeling self-righteous and sinfully disloyal to my tribe of origin and the world of power and prestige that being doctors conferred upon them. I read Marsha Sinetar’s ORDINARY PEOPLE AS MONKS AND MYSTICS, and some deep bell rang with a resonance that continues to this day. Sinetar interviewed dozens of people who had chosen lives of quiet, individual prayer, ritual and worship outside the church, outside any established order. These were people who had found their own way by searching deeply inside themselves. Their truth was self-actualized. I still have this book, and have returned to find inspiration in it many times over the ensuing years. FORTIES: Providing massage therapy to survivors of torture and war helped me to reconcile my continued commitment to political activism with my job as a provider of individual care and comfort. I grappled with how to reconcile the immensity of the evil of political torture, the effects of which stared back at me through the haunted eyes of my survivor clients. I went into the work determined that torture must end. I left the work, 12 years later, knowing that the darkness and suffering I had witnessed were both out of my control and beyond my ability to comprehend. My friends in the bodywork community who were Buddhists were particularly helpful in my coming to terms with these issues. As they pointed out to me, who am I to judge? How can I know where such horrific experiences come from, or will lead? I can offer care from moment to moment. That is all. This stance brought me through a period of great anger and anguish, to a place of relative peace and acceptance, despite the pain of this work. My best friend during this time was Jewish, and part of an alternative minion, a group of young families who met on Saturdays to worship together in a way that both honored the Jewish spiritual traditions and rejected many of the institutional forms that Judaism had taken. I felt a yearning to have what I saw there. A spiritual home. But seeing nothing around me, I created some spiritual content on my own. 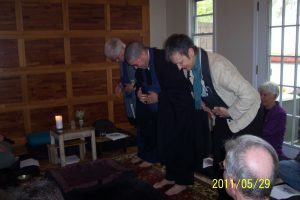 My work with my clients increasingly took on various forms of ritual. I created rituals for my children’s 13th birthdays. We also had family rituals for the Day of the Dead and the winter solstice. The truth of life outside of the rational, linguistic, western ways of knowing became more important to me. I also struggled with anxiety, heart palpitations, fear of death, workaholism and a consuming drive to excel, which created concentric circles of suffering in my kids, my partner, friends and family. My professional identity evolved toward a focus on the integration of body and mind with trauma survivors. I completed numerous trainings in therapies that used mindfulness as a vehicle for clients to study their own lived experience in real time. I was very moved by the experience of learning to be fully present with a client. The language and the mindset of mindful presence was both profound and intimidating in its intimacy and immediacy. I began to meditate in order to strengthen this new set of professional skills. The integration of body and mind increasingly became a personal practice as well. Beginning to meditate was painful physically and psychically, way outside my comfort zone of high octane performance. But I kept going. So many books on Buddhist thought helped inspire me to try to sit still, to have faith that pure presence was the key to Nirvana, the end of suffering. FIFTIES: One of my teachers in mindfulness-based therapeutic methods became ill with cancer and died soon after. He was my age, 51. Both before and during his dying process, Dan was committed to the practice of Buddhism. I had many conversations with him during which my unexamined assumptions about life, death and suffering were completely blown away. He was learning so much, he was willing to share his journey, his insights, and I was ready to hear them. He was walking through the dying process while his heart opened up. He was not consumed with fear, but determined to utilize this time to find deeper truth, deeper safety, deeper love. He encouraged me to get serious about my spiritual practice. His experience of awakening through the dying process was just the encouragement I needed. I had also become ambivalent about psychotherapy as a means of addressing my own unhappiness. After a horrible break up with a business partner, I felt at sea. Psychotherapy was unable to reach the pain I felt. This, despite the fact that I was now practicing psychotherapy with my clients, as well as beginning a master’s program in counseling. I began to look for a spiritual teacher. The yearning for a spiritual home went deep. But nothing I tried, no group I sat with, no teacher whose dharma talks I heard could touch that yearning. It is so uncanny that during our first meeting in the zendo at A Single Thread, I was given the choice of seeing the resident priest as a psychotherapist or as a spiritual teacher. Both were not an option. I did not hesitate. This woman sitting across from me, with her shaved head, the altar behind her, her deeply grounded energy was my spiritual teacher. Is my teacher. I had come home. I was 53. My early experiences of sitting at A Single Thread were simultaneously excruciating and very, very comforting. I had found not only a teacher but also a community, and a centuries-old wisdom tradition. I felt deeply held. I also hated the painful, long periods of sitting, and was intimidated by all the form I stumbled through for weeks until it began to make sense to my body. I particularly remember my early experience with chanting. The chants were long, and the form was to chant quickly, without pause. My intellect was quickly overwhelmed, I could not comprehend the meaning of what I was chanting except in small bites, randomly, over many Sundays of repetition. It was like no other experience I had had before. I felt the meaning of the chants wash over me, without comprehension. I let them happen to me, my intellect having been defeated. Slowly, over months and years, the meanings of these ancient teachings have been revealed…or continue to lie waiting for the right moment when I am ready to receive their wisdom. I became a regular participant in the activities of the sangha. The teachings were like water for my thirsty soul. I drank and drank. I also fought constantly with the practice and the teachings. My pride and fear and anger, my drive and my resistance to letting go of my ego were ever-present, especially when I sat on the cushion. It has taken me many years to settle down those persistent, aroused energies. Suzuki Roshi said, “Eventually, clear mind will come.” He was right. It did. It comes and goes. Nothing stays the same. At home, my husband wanted to hear in detail about what was taught each Sunday. It would always spark a deep conversation between us. I so wished he would come with me to sit, his own pain was tearing him up. But he stayed separate for a long time. When he did begin to come to sangha, I was overjoyed, both for him and for me. With the help of the practice, and our teacher, I have watched as my husband’s hurt and anger have transformed. And, I cannot imagine a luckier person than I, having both a spiritual teacher and a partner who is now fully committed to this path. The intimacy we have worked so hard to achieve in our marriage has found its pinnacle in this spiritual intimacy, where both our closeness and our boundaries with each other are serving us to learn, grow, struggle, be supported and have our own autonomous experiences. I am so very grateful for what we have separately and together been given. In the beginning of “37 Practices of a Bodhisattva” (http://unfetteredmind.org/37-practices-of-a-bodhisattva/, accessed 11/18/2017) it is written, “Right now, you have a good boat, fully equipped and available — hard to find. To free others and you from the sea of samsara, day and night, fully alert and present, study, reflect, and meditate — this is the practice of a bodhisattva.” YES, I have a very good boat. During one period in the life of the sangha, sangha members were invited to give the Sunday dharma talk. One Sunday it became my task to give the talk, for which I prepared a detailed outline of my remarks. When I finished, my teacher gave me a further assignment: to come back the next week and speak without any preparation. I was completely terrified. I had often taught in other contexts, but never without hours of preparation and copious notes. That dharma talk, where I had almost nothing to say, and had to sit while my fellow sangha members waited patiently in the silence, was a profound teaching for me. I learned how much I work to take care of everyone’s experience, to make sure others are entertained and impressed at the expense of the truth as it comes through me in the moment. For how authentic can one be when all the preparation took place in the past? I learned the absolute power of what can happen when an audience and a teacher and a subject come together uniquely in the moment, and an experience is created out of that moment. Since then, I have found this way of teaching to be a compelling alternative. To show up NOW, to teach what one knows NOW, to invite the wisdom of this moment to come through one NOW, not from one’s storehouse of dusty ideas. That is one example of how the delusion of striving for excellence has stunted my spirit and shaped my ego. Here is another: For 4 years now, I have been working to create my personal artistic expression of the Wheel of Suffering, an ancient Buddhist mandala, packed with teachings if one is willing to put in the work so that the ancient images come to life in the present. Working with each individual image, I have learned first-hand about the spiritual unfolding of something from nothing that we call the creative process. I have learned to wait, with faith, knowing that an idea or an image, truth, will emerge. Tolerating the void and staying in awareness allows the channels of my being open to an idea arising out of emptiness, into consciousness. Through applying this process to the Wheel mandala, I have learned so much about my own habits of mind. Now, the images I have created are like mile markers, reminding me when I am suffering of how I create this conditioned pain, how I choose to go down those old paths once again. As I deepened into my Wheel project, I noticed that each time I worked with the images, I would leave feeling giddy with excitement about what I had created, and thrilled to present the project to my sangha. I raced to complete enough of the images that it could be ready for a “showing.” My teacher caught on. She forbade me to present my Wheel project. I was furious and hurt. All my drive toward having my excellence finally seen…dashed on the rocks of continued obscurity. It was a painful period, but eventually, I saw clearly the wisdom in her instruction. I admitted defeat. It became a time of concentrated investigation into my addiction to fame and glory, and continued through the process of eventually presenting my Wheel to the sangha. My teacher was with me every step of the way, guiding me through my own addictive process, protecting me from too much, assisting me to investigate the deep, deep fear and hate and greed that drives the striving. Another arena of spiritual struggle and learning for me has been my tendency to approach challenges from a psychological perspective. I continued to work professionally with survivors of trauma, offering them the skills of recognizing, accepting, investigating and disidentifying from their own habits, conditioned as they were by overwhelming and traumatic life experiences. It has taken me a long time to see in myself, and I can still be blindsided by, my habit of investigating some painful emotional knot inside me using a psychological paradigm, which originates from the agenda of making the egoic self happy and functional in the material world. This is not a bad thing; however, it is not spiritual work. I had to unlearn (I am still unlearning) my tendency to fix, to clean up my “act.” I am still learning how NOT to make my spiritual work into a self-improvement project. In Zen as it has been taught to me, little direct instruction is given by the teacher to the student. Each of us is called to find her/his own way to practice. The teacher can point out when one is off the mark. The rest is up to the student. What is more, the spiritual teacher-student relationship is not based in a need for the student to feel loved by the teacher, as is usually the case in psychotherapy. There is not a dependence on either one of the partners to the relationship being kind or gentle or protective. Just the truth matters. This truth, and the devotion of both parties to the truth, does create a relationship of deep devotion for each person to the other, teacher and student. But the devotion is not based in needing the other person to like you or pay you. As a student of Zen, I was experiencing all of these differences between my professional world and my spiritual world. I found it very difficult to see the differences, to accept them, and to let go of my identification as a psychotherapist. And, at the same time, I found I had less interest in the work of psychotherapy every year. I began to work fewer hours and see fewer clients. I stopped taking notes on each client session, something I had enthusiastically and faithfully done always. My favorite clients were the ones who identified as spiritual seekers, to whom I could offer counsel that was a hybrid of psychotherapy and spiritual guidance. I yearned to have more time for spiritual practice, to remove the psychological threads from the spiritual fabric I wove. My teacher announced to the sangha that she had been given permission from the Chan hierarchy to create a contemplative order, and was authorized to ordain monks in this new order. My heart leapt. THIS is what I wanted for my life. This is what was important. My Wheel card depiction of the Human Realm kept coming back to me—the girl with the seeking eyes, the girl who KNOWS, buried under layers and layers of the stuff that distracts me and diverts my best energies away from that which truly matters. My partner was approaching age 65, and was moving toward retirement. We knew there was a way we could financially swing it so that I could retire also. My ego fought this possibility with great determination. The fear of being a nobody in the eyes of my family, my colleagues, the fear of leaving my clients to pursue a spiritual life was so intense. I struggled and contemplated and struggled more and spoke often with my teacher. I wrestled with it. And, eventually I saw very clearly that what I truly wanted, underneath all the identification with being a therapist was to be done with it, to move with trust and faith toward a greater commitment to a spiritual practice path. I wanted to be an ordinary person who was also a monk. The clarity I felt was fleeting but stark. It was followed by long periods of anxiety and doubt, but the clarity remained as a vivid memory to guide me through the long painful process of shutting down my practice. SIXTIES: On the weekend of my sixtieth birthday, we downsized into a studio apartment. I had closed my therapy practice two months prior. We were free. That next winter, holed up in the warm studio apartment we call “the cave,” I knit a sweater and made a red felt Yama for my Wheel mandala in between bouts of acute neck pain and headaches. There were weeks when I spent most days on the couch, unable to move much. Finally, it occurred to me that this pain could be part of my spiritual work. I made flash cards from an excellent article my teacher gave me on how meditators can work with illness. I proceeded to practice with building an internal holding environment that could remain grounded and present to all the fear and hurt. The more I could do this, the more the painful, constricted energy began to move. When I could meet the pain from a stance that was calm and accepting, that constricted energy could let go. I felt many emotions come pouring out of my body, old held emotions that I did not know were in me. Over several months, I let go of many old holdings. And, I learned at a deeper level what it means to be empty. No wanting, no knowing, no meaning, no labels. No matter how painful. It was the power of something greater than myself, living within me. For two years after I retired, I grappled with fear and doubt about the decision. I meditated more, I participated more in the life of the sangha, my spiritual life deepened but I could not shake a persistent feeling of anxious dread at being without the professional identity with which my personal sense of power and prestige was linked. It took a long time to calm this down. And in the meantime, despite my initial enthusiasm for being a monk, I hesitated to take it on. It was enough to have ended my professional life. I needed time to lick the wounds and regroup. During this time, the Single Thread sangha died a slow, gentle, natural death. I felt great sorrow, and for a while, resisted the death with my own frantic attempts to keep things going. But, the maxim is true: Loss is a much better spiritual teacher than gain. I am very grateful for all I learned as the sangha went away. It lives on in my heart, as great love for a series of fleeting experiences that, at the time, seemed like something solid and dependable. For a moment in time, this wonderful space for practice flourished in the material world. “All that I serve will die, all my delights” (Wendell Berry, “The Wish to be Generous” http://www.rjgeib.com/biography/places/mgeib/generous.html, accessed 11/18/2017). I also learned that when I take refuge in Sangha, it is not a physical space in which I take refuge. It CAN’T be, the physical realm is transient. The sangha in which I take refuge lives with Buddha and dharma in the realm of the truths we hold as true for all time: that beings can, and are, awakening. We take refuge in Sangha as an expression of that awakening potential of all beings. We had purchased a tiny home on wheels in Wisconsin soon after our retirement. Towed it to a ridge-top meadow on the farm owned by dear friends who had been our neighbors in Chicago. Their farm is a 15-minute drive from my grandfather’s farm, where I had played as a child, and learned to love the natural world. After 30 years of living in the city, now we had 6 bird feeders outside our windows, views of the sunrise and the sunset every day, meadow grasses, wildflowers and oak trees both ancient and sapling-stage to watch as they made their rounds of the life cycle through the seasons. Not having a physical sangha to tend to and attend, we began to spend weeks, months at a time at the tiny house with the natural world around us as our teacher and friend. At Easter last spring, I found myself alone in my house for 5 days, and proceeded to organize the time into a solitary spiritual retreat. For the preceding year I had been pursuing an understanding of Buddhist concepts of death, karma and rebirth. My teacher had been increasingly focused on the idea of eternity, of the Absolute, of God as motivating her own spiritual work. It was news to me that God could be part of a Buddhist spiritual paradigm, but over time I had opened to the possibility that an Absolute presence was part of the Buddhist bargain. Yet, since my ‘break-up” with God at age 13, I had held to the belief that there was no heaven, no hell, no afterlife. I was investigating where the truth lay between these discordant assertions. I first learned that the Buddha described the truth beyond impermanence as “unborn, undying and uncreated” from Kennett Roshi. I saw that a series of her talks, entitled “The Delusion of Illness and Death,” were available online, so I decided to make this part of my Easter retreat. The first of these talks hit me right between the eyes. In it, Kennett Roshi states with great clarity and confidence, “YOU WILL CONTINUE.” (“The Delusion of Illness and Death,” Rev. Master Jiyu Kennett, Talk 1, Part 1, https://shastaabbey.org/houn-jiyu-kennett/, accessed 11/18/2017). She describes her own near-death experience, and also the works of others who have studied near-death experiences. Over the next two days, I came to the full realization that We Sit in Eternity. Eternity, of which we are all part, is merciful, grace-filled. I felt fully the truth of this, I KNEW it to be true. So much fear fell away. I felt waves of relief and joy, waves of letting go as I surrendered to being cared for…eternally. It was a safety I had never known could exist. A 4-day Vipassana retreat in Madison, one month later, featured Ayya Mehanandi as guest teacher. She is……radiant, funny, incredibly strong, vulnerable, human, and a great teacher of the dharma. Being in her presence, I knew I was ready to turn toward the work of becoming a monk. Author: Getsu San Ku Shin, A monk in training.